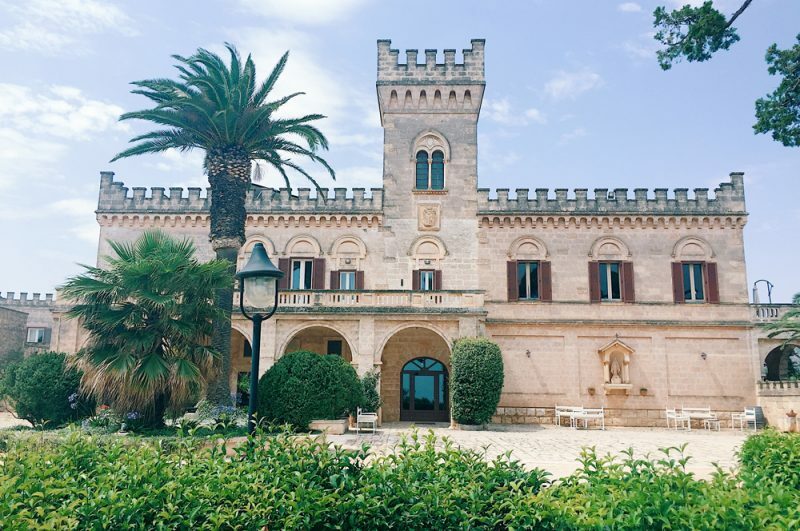 Masseria Salamina – Farmhouse or Castle? Booking this year’s holiday was a no brainer. Having worked in the airline business, I knew all flights would go on sale in January. So come 5th January I was on it. I hunted down the best prices for flights on Easy Jet to Bari (approx. £100 pp including checked luggage). Job done! I’ve travelled quite a bit around Italy and it’s definitely my favourite European destination. Great food, wine & culture, what’s not to like? And let’s not forget the Italian men in their very small speedo’s. Smiling lots! Seriously, Italy’s got it all. So after having done some research into Puglia I came across Masseria Salamina. it was just what we wanted. A small, boutique(ish) place away from the hustle and bustle of an Italian city. Check out the reviews on Trip Advisor. The reviews speak for themselves. It’s an intimate family run farmhouse with 25 rooms. Psst…it’s the best looking farmhouse I’ve ever seen. Looks more like a castle to me. 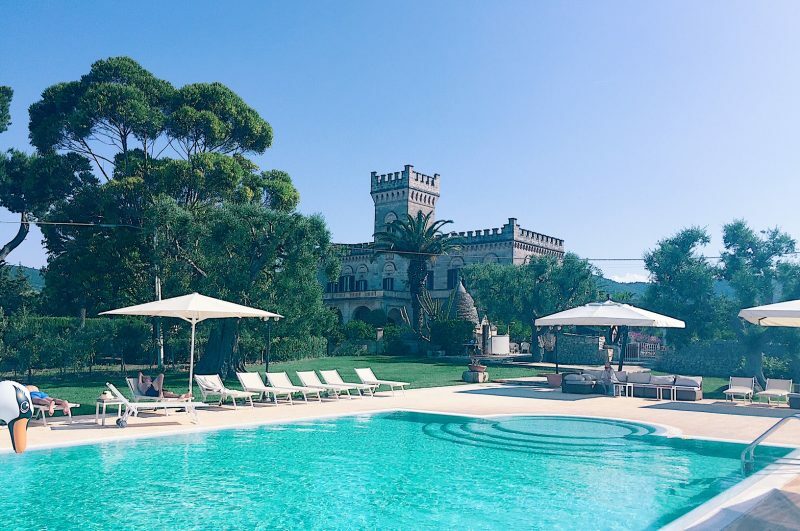 The castle, sorry I meant farmhouse, is set off the beaten track and is surrounded by olive trees. The house and grounds are simply stunning (the photo’s don’t really do it justice). It has its own swimming pool, which we had to ourselves a lot of the time. It’s close to the beach (less than 10 mins drive) and the produce is all organic. And on top of that they even make their own olive oil. Perfecto! We hit the jackpot. The real Italy. So there was no question for us not to go back. Farmhouses or Masseria’s as there often known as, are becoming increasingly popular in Puglia. So if it’s something different you’re after check out the Conde Nast article – The Best of Puglia. Trust me after reading this you’ll want to stay in one. So were we disappointed with our second visit? Absolutely not! Masseria Salamina is run like a small hotel, but a hotel it isn’t. So if you’re looking for hotel facilities (24 hour service, lively bar etc) then this probably isn’t the place for you. The service here is a little relaxed. But hey, they don’t need to rush and neither do you. So just chill out. Isn’t that what holidays are all about? We were greeted by Chiara who greeted us like long lost friends and amazingly remembered I’m a vegetarian. Now that’s what I call service! Nothing was too much trouble. They repeatedly offered us various veggie options (outside of their menu). Want an early dinner for Z? No problemo! Give them 20 minutes and bingo it was ready. Also, Filippo’s (the owner) courgette risotto is to die for. And just how risotto should be, silky, smooth and deliciously rich. Bellissimo! Breakfast is a continental affair. With homemade pastries/jams/local meats and fresh eggs from their very own chickens. Dinner is more formal with a 4 course meal served in the courtyard. But you can pick as many courses as you like. I could never manage 4 courses, but Willis on the other hand was happy to eat all his 4 courses and then start on mine. Lunch on the other hand is very casual and is served by the pool, mainly consisting of homemade pasta’s and salads. 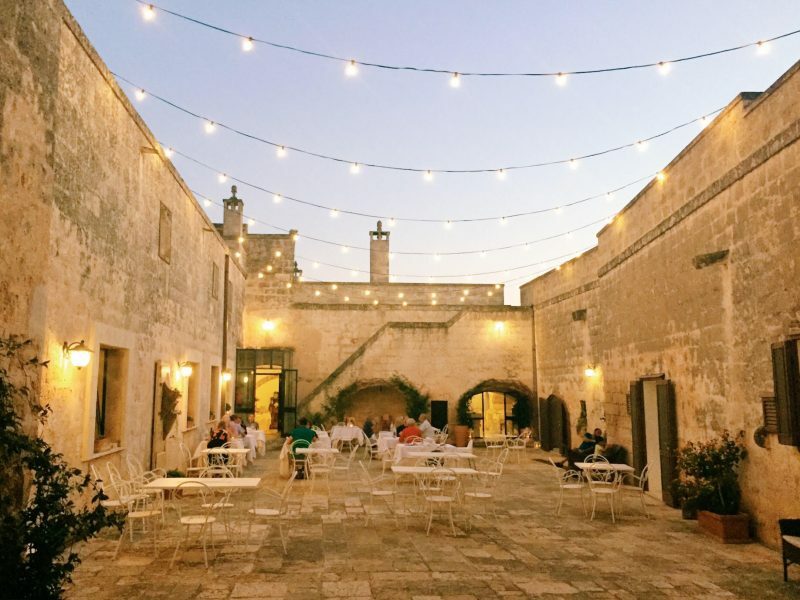 We ate at the Masseria a couple of nights. And on the first night Willis didn’t finish his bottle of wine. We returned the following evening to be offered the same bottle of wine which they had saved and corked the night before. How amazing is that? Now, you wouldn’t get that kind of service in a hotel, would you? The rooms in the main house are pretty special. Very ornate, and beautifully styled with Italian antique furniture. So if you really want to treat yourselves book one of these rooms. You won’t be disappointed. But, for us the stable rooms, which are like a small apartments were perfect. Simple and very clean. Our room had a little kitchenette with a large fridge which was great for stocking up supplies from the local town (less than 5 mins drive). We also had a separate lounge area with a sofa and small dining table. And it doesn’t stop there, we also had our own outside space with another dining table and sofa to soak up the evening sun. There’s also an organic vegetable garden around the back of the farmhouse, where you can help yourselves to whatever is growing. There’s also a few animals on the grounds too. Z’s morning ritual was to feed the horses and chicken’s before breakfast, pretty cool wouldn’t you say? Masseria Salamina is a real Italian experience. They cater for all sorts, individuals, couples and families. Even parties and weddings. Hint hint Mr Willis. Smiling lots! So, if you’re looking for complete peace and quiet, away from the crowds. And I mean away from everything, then check it out and I promise you won’t be disappointed. The owners will treat you like family. Nothing is too much trouble. It’s a home from home kind of place. A place where you can truly relax, kind of place. A place that makes you smile, kind of place. A place that gives you a big bear like hug, kinda place. It’s perfect! And put it this way, it takes somewhere special for us to go back, again! Note: If you’re a large family the only downside is they don’t have any interconnecting family rooms, but they are happy to add in extra beds if you need (max 4-5 in room). So it’s a Bravo, Bellissimo & Perfecto from us to Masseria Salamina. 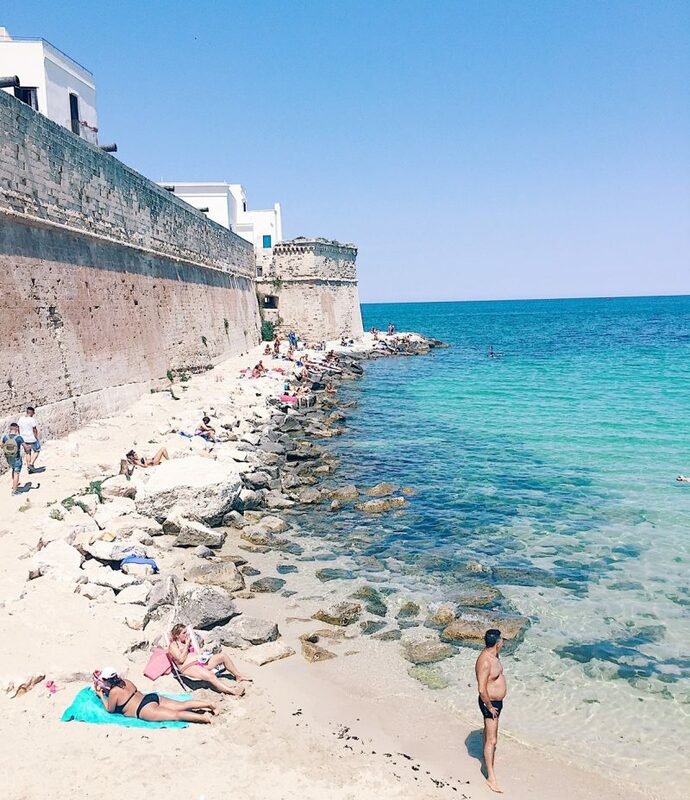 Monopoli – is a lovely seaside town with a small beach that comes to life in the evening. Don’t go during the day, as the place is pretty much dead. The Italians down south like a siesta, a bit like their friends in Spain. This is pretty much the case for most of the local towns. But it’s definitely a place to check out in the evening. The place is heaving!! 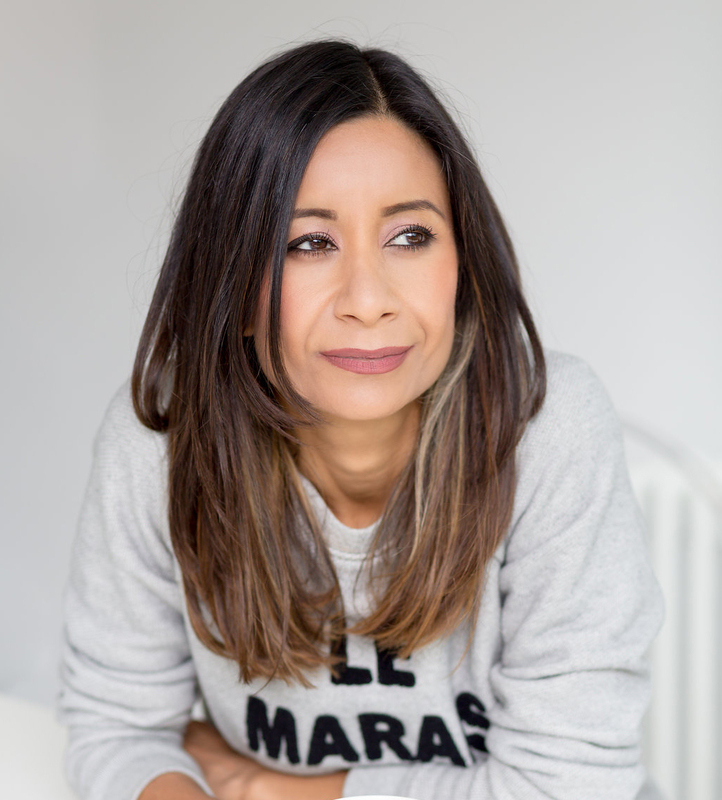 The restaurants, bars, café’s and ice cream parlours are full of people enjoying life. And at the weekends the place is jostling with locals dressed up in the finery. You could wind away hours just people watching. And if you love ice cream check out Caruso, they sell the most amazing Gelato I’ve ever tasted. And that’s saying something from an ice cream snob. You can’t miss it, there’s usually a line of people queuing. But don’t be surprised if you get shoved out of line as Italians don’t really do queuing, like we brits do. Polignano a Mare – is picture postcard Italy. It’s a small town with an amazing rock beach (which is free!). Hence, the place is jam packed with locals. But get there early to nab a decent space and don’t forget your picnic, towels and umbrella. Advice: It’s amazing for adults, but not so great for little ones, because of the rock beach. 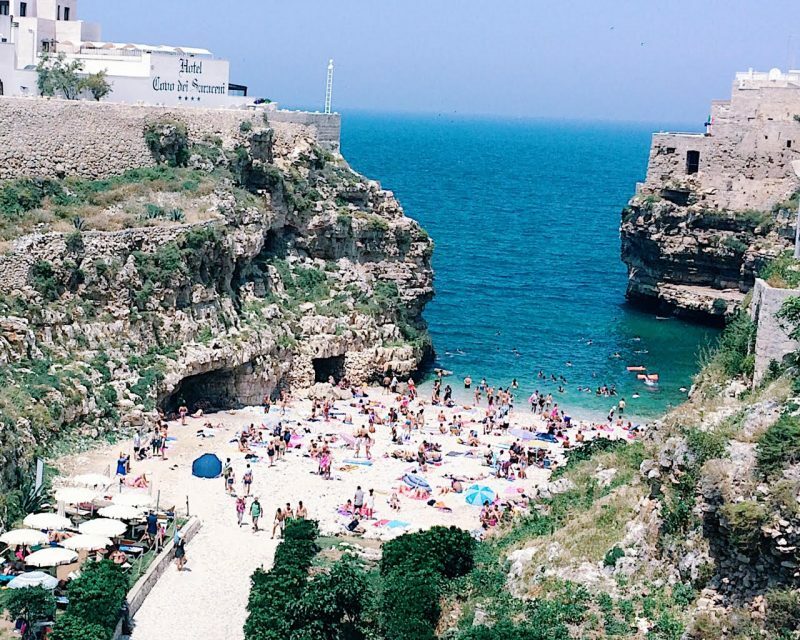 Anyways, I need to stop waxing lyrical about Puglia, because I could seriously go on for days. But I’d love to hear from you if your planning on going or have been before. Don’t be square! Join the rug revolution!